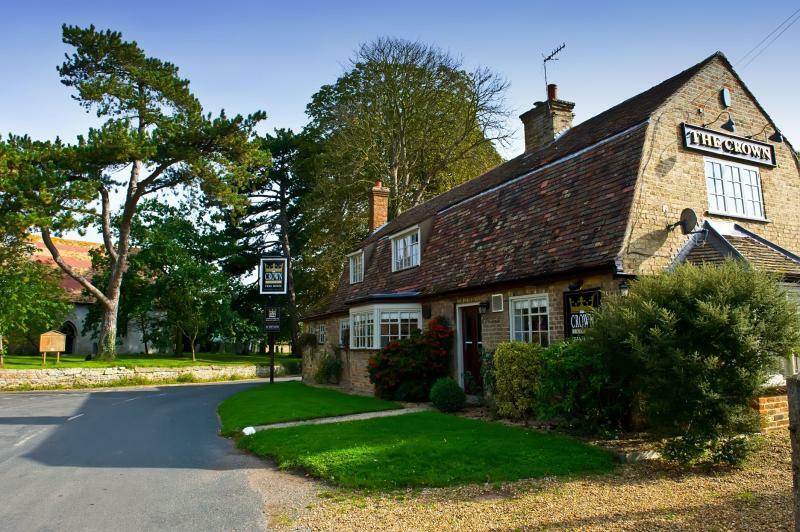 Originally part of the medieval manor of Broughton, the brick-built Crown Inn has done great service over the years as a watering hole and saddler's shop with thatched stables and piggeries attached. A group of villagers saved the place from residential development in 2001 and, following a recent change of ownership, it is embarking on a new lease of life as a gastropub/restaurant complete with terracotta tiled floors, pine furniture and pastel colours. The restaurant area has space for 32, and successfully combines a traditional pub interior with touches of contemporary design. Among the delights on offer might be home cured grav-lax with cucumber and a sweet mustard dressing, crayfish and avocado tian, and slow braised lamb shank with leeky mash and redcurrant & rosemary jus. The kitchen also delivers 'classic flavours' in the shape of sustainable fish and homemade chips, pea & mint puree & tartare sauce or char–grilled rib eye steak with watercress, homemade chips, mushrooms and horseradish crème fraiche, while desserts are mostly old favourites with a twist - as in apple pudding with butterscotch sauce and ice cream. The short global wine list is noted for its keen prices and high quality. The Crown Inn used to be one of the better pubs in Cambridgeshire. But, alas, it seems to have gone remarkably down hill of late. We went today, to celebrate my wife's birthday. The starters were nice, but several of the mains were poorly cooked, and the birthday cake they provided was a disaster (partially burnt and partially uncooked).